Lionel lives near this great community gathering place and has been planting trees here for over 5 years. In all, hundreds of trees survive today and in not too long, the site will be a great forest. Oaks, sycamores, redwoods, cypress, as well as a variety of native and drought tolerant shrubs and forbs have been planted on the site. Plants will stabilize the slopes around the campground as well as provide privacy and noise reduction from the nearby interstate. The site is a tough place to plant with steep slopes and tons of gophers. Gopher baskets had to be hand made by numerous volunteers. The grounds crew at the hot springs looks out for the long-term care of the plants, and is doing a great job! Avila Hots Springs offers volunteers who helped with the tree plantings free one-time entry into they springs to celebrate! 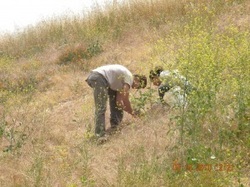 Many groups have helped with the planting, including Empower Poly, Sierra Student Coalition, the California Conservation Corps, and community members from all walks of life.